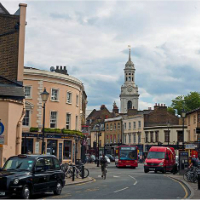 Tetlow King Planning were part of a team which achieved Secretary of State approvals for the redevelopment of a rundown industrial estate with a mixed use scheme comprising a hotel, 226 residential units and new employment units at Greenwich High Road, Greenwich, on behalf of Galliard Homes. Robin Tetlow, Chairman, gave expert housing evidence to the two week Inquiry. The Inspector and the Secretary of State both supported his evidence that the failure to fully comply with development plan objectives on mix of unit sizes and the division between the types of affordable housing would not cause significant harm. Indeed they both agreed that the site would contribute significantly to meeting strategic housing requirements and that the 50% affordable housing offered was “a strong factor in favour of the schemes” particularly in view of the Council’s recent delivery record. The close relationships of the blocks was sufficient to ensure an integrated community and the reservations of the Housing Department were not justified, particularly in view of the interest expressed by three RSLs. Mary Crook of 2-3 Grays Inn Square acted as advocate for the appellants.